When people think of Queensland, there are some common images that will automatically spring to mind. Most will think of the long stretches of sandy beach lining Surfers Paradise, the crystal clear water and white sand of Whitehaven Beach, Heart Reef in the Whitsundays or the towering skyline of Brisbane. If you are a keen photographer, you might also throw in Lady Elliot Island, Lamington National Park and Palm Cove in Cairns. Each one of these places has a certain magic to them…. and for good reason, however there is definitely more to the Sunshine State just waiting to be discovered and uploaded to your Instagram account! So where are these places that are guaranteed to make my friends envious you say? All right here in Queensland’s Capricorn Region, part of the Southern Great Barrier Reef. Now I’m a person that likes to share, and it just doesn’t seem right to keep all of these stunning locations to myself, so read on to find out my top 5 spots that are sure to generate some #FOMO in your social channels! If you fancy some underwater scenery, then Monkey Beach is the place to be….or if sea creature selfies are your thing, then I would recommend snorkelling around the old observatory. There are a variety of fish there that are always keen to photobomb your shots. For some spectacular views, you’ll want to try the walk to the top of Mount Wyndham. There are a number of great beach locations for taking sunrise photos along the Capricorn Coast, but my ‘go to’ location would have to be Emu Park. Emu Park is a sleepy little coastal village approximately 20kms from Yeppoon. There is a rocky beach down near the boat ramp and because of the changing tide, you will always find new compositions to capture. A short walk from the car park and you will find the famous ‘Singing Ship’. The monument is dedicated to the commemoration of Captain James Cook’s explorations in the area but it also serves as a great focal point for photos. If I had to pick one place in Rockhampton for sunset then this would probably be it. Murray Lagoon is part of Rockhampton’s heritage listed Botanic Gardens, regarded as one of the best in regional Australia. Not only do you get to enjoy great water views, but there is also plenty of birdlife. The reflections on the lagoon during sunset are stunning and there are numerous places along the banks to frame up the perfect shot. Just watch out for the geese…they can sometimes be a little cranky! 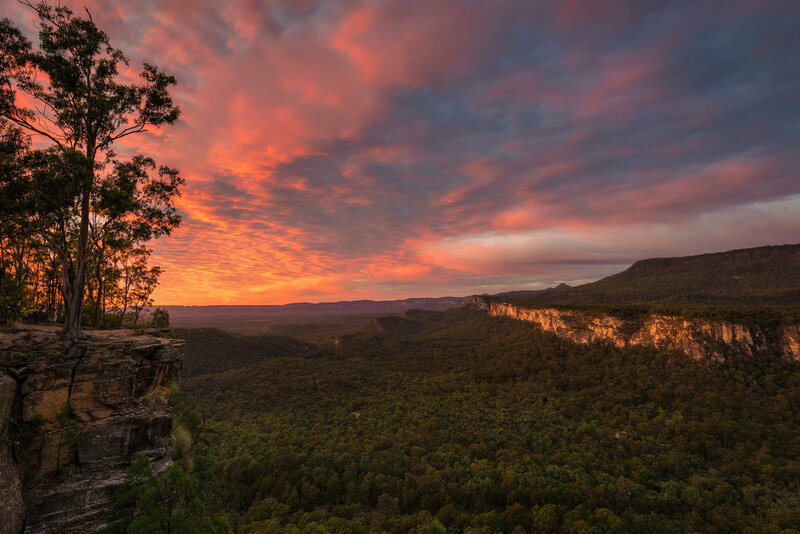 Blackdown Tableland is a massive sandstone plateau that rises abruptly out of the flat plains surrounding it. In amongst it’s rugged cliffs you will find deep gorges and plunging waterfalls with pristine swimming holes to cool off in after a moderate hike. My ‘must see’ suggestions here would be Rainbow Falls (Gudda Gummoo walk 2km) and the large, unusual pools at the start of the Mook Mook walk. To capture some jaw-dropping views, the best spots are Two Mile Falls (Goodela walk 1.8km) and the main lookout (Yaddamen Dhina) which is right beside the road on your way in to the National Park. If your friends are hard to impress and you want to really bring the WOW factor then you can’t go past Carnarvon Gorge! This is a location that should be on every landscape photographer’s bucket list. It is a place that I personally, keep coming back to year after year because I just can’t get enough of it. There are over 27 kilometres of graded tracks surrounded by towering sandstone cliffs. Around every corner you are confronted with views that are worthy of the hashtag #epic and while exploring, it is easy to forget about the outside world. The gorge is also a great place to see a variety of wildlife, with over 173 bird species inhabiting the area and other native animals such as platypus, kangaroos and king parrots. P.S. When you do get here, don’t keep all your amazing photos to yourself. Make sure you share them with us and the rest of Australia using #VisitCapricorn #ThisIsQueensland and #SouthernGreatBarrierReef. Since arriving back from Tasmania I’ve had a bit of time to go through most of the images I captured and I thought I would share some of my favourite shots and locations with you guys here on my blog. Tasmania is definitely like no other part of Australia in that it can go from wild and rugged wilderness to pristine coastlines, rainforest, rolling green hills and snow capped mountains all in the space of a few hours in the car. The diversity in landscape makes this place a paradise for photographers and is one of the reasons why so many people from all over the world flock to our island state every year, in all seasons. For as long as I’ve been a photographer, I have always wanted to visit Tasmania. I also knew that if I ever got there, it couldn’t just be a quick trip. It needed to be for a decent length of time if I was ever going to experience the diverse landscapes that I had seen captured so beautifully by the multitude of other photographers that I follow online. I came to the conclusion that 9 weeks would be the perfect number for my journey around Tasmania and as you can see by my crude scribblings on the map, I was able to cover a fair bit of ground in that time. The walk in to the falls is a moderate grade 1km hike that follows a series of cascading falls down the Liffey River to the main lookout. There are many spots along the walk that are worth stopping at and I found multiple vantage points to shoot from. Liffey Falls State Reserve is located in the rainforest areas of the Great Western Tiers mountain range in Tasmania's north and is part of the Tasmanian Wilderness World Heritage Area. You are certainly spoilt for choice when picking compositions here and the rainforest colours are sublime. This would have to be one of the most photographed boat sheds in all of Australia. Because of this, capturing an original composition of this location is extremely difficult. I visited Cradle Mountain on two separate occasions during my time in Tasmania and it was only on the second attempt that I was able to come away with an image that I was proud of. Due to its popularity, the only time you are likely to get an image without other people in it is at either sunrise or late sunset/evening, and even then you may need to hustle past a few other photographers to find the best spot to shoot from :) Fortunately on my second visit it was pretty quiet and by the time I had waited til blue hour, there was only myself and a friendly couple from Melbourne who were also looking to gets some shots 'crowd free'. From the moment I set up my tripod I fell in love with this tree and I knew that I had to somehow include it in my shot. Unfortunately I experienced a fair amount of overcast weather while visiting Wineglass Bay in Freycinet National Park. The fact that I was in such a beautiful location but not getting any decent images was starting to get a little depressing. This creative funk lasted until one afternoon on the drive back to camp I decided to go and explore a small beach called Honeymoon Bay. For thirty wonderful minutes the clouds parted just enough so that the sun could light up the surrounding mountains and change the colour of the clouds to beautiful shades of pink and orange. Needless to say I was running around like a crazy person trying to fit in as many shots as I could while the light lasted. I had never heard of the Devil’s Gullet prior to visiting the area around Mole Creek during our last few weeks in Tassie. A local national parks ranger had told me about it and despite the foreboding name, it sounded like a great place to get some shots. Especially since there had been recent snowfalls on the surrounding mountains. The views on the drive up there were phenomenal and the final lookout took my breath away...literally. The wind was sooo cold. I was a little unprepared for the conditions and I had left my gloves back at the caravan. I have never felt so numb with cold as I did that afternoon, but I couldn’t help but have a big smile on my face while I watched this awesome light filtering through the valley. The light dusting of snow across the tops of these jagged columns really helped to highlight the dark foreground again the pastel colours in the sky. If you are interested in knowing more about the above locations and the techniques I used to capture these images please feel free to comment below, use my contact form or you can direct message me via one of my social accounts (Facebook/Instagram). So as you may have guessed from my Facebook posts, we have returned home from our big adventure, albeit a little early. The plan was originally 6 months however as the mercury was starting to rise and the roads were getting busier, we decided that it was time to return home. Not that we had stopped enjoying ourselves….far from it (who wouldn't enjoy traveling around the country for 5 months) but we missed our family and once you start heading in that homeward direction, it’s hard to step on the brakes. Regardless of the early return, we could not have asked for a better trip. We truly do live in one of the most beautiful countries in the world. I always knew we had some amazing natural wonders here, but you can never truly appreciate how amazing until you visit them. There are other great places all over the globe, however the furtherest abroad I have ever been is New Zealand and before jet-setting to anywhere else, I really wanted to experience what we had on offer in our own backyard. Now that we have returned though, I really wanted to put together a post detailing some my favourite locations and images from the trip. The hard part though is deciding which locations to cover. Hopefully what I have included below will serve to not only show where we travelled but help you out with planning your own adventures. Carnarvon is one of those places with so much to offer that it would be impossible to see it all in one visit. It is a place that I have explored many times over the last 5 years and I still can’t get enough. On this particular trip I climbed up to Boolimba Bluff (something I hadn’t done before) and I was fortunate enough to witness one of the best sunrises I have seen in a long time. It’s always a gamble that the light isn't going to be right when you have to hike so far to get to a particular shoot (especially when that hike involves so many steps), however on this occasion my hard work was well rewarded. For accommodation at Carnarvon Gorge, my recommendation is Takarakka Bush Resort. They have numerous options ranging from caravan/camping to cabins and studio rooms. How do I sum up the largest mountain range in South Australia?! The word EPIC comes to mind a lot. With over 430kms of spectacular vistas, its hard to not come away in awe of the sheer size of this place. I wrote a post on this area earlier in the year (which you can read here) so to save repeating the same information, I will just say this - YOU NEED TO GO TO THE FLINDERS! and if you are a photographer YOU DEFINITELY NEED TO GO TO THE FLINDERS!! If you are into Astrophotography, then Lake Bonney really needs to be on your list of locations to shoot. Lake Bonney is located near the town of Barmera in the Riverlands region of South Australia, approximately 230 kms from Adelaide. If you strike the right conditions with clear skies and low wind you can expect to get some great shots! You can free camp right beside the lake and while there are no facilities, you can’t beat the views. Standing outside our caravan, almost knee deep in the water, I felt like I was surrounded by stars. You could see them in the sky and also their reflections in the water. It was almost as if the sky and the water were connected in one endless space of celestial light. Murphy's Haystacks on the Eyre Peninsula are Stonehenge-like, natural rock formations known as inselbergs. These uniquely shaped granite boulders are located 40kms south-east of Streaky Bay. There are a number of small groups of these in the area right in the middle of a farmers field! Their name originated when a traveller in a coach saw the formation from a distance. He thought the mounds to be bales of hay and he asked how a farmer could produce so much. As the farm was on a property owned by a man called Murphy, the rocks became known as Murphy's Haystacks. The property owner allows self contained travellers to camp there for the night for a small fee of $10. Well worth the money as it allows you to be there to capture both sunrise and sunset. The farmer also produces his own honey and it is for sale there with an honesty box for payment. Do yourself a favour and pick up a bottle (or two) as it is the best you will ever taste! The Otway waterfalls have been on my ‘must see’ list for some time and I was so excited to be able to see them. The falls are a relatively short drive north-east from the Great Ocean Road and there are 3 main locations that you should visit. These are Triplet Falls, Hopetoun Falls and Beauchamp Falls. 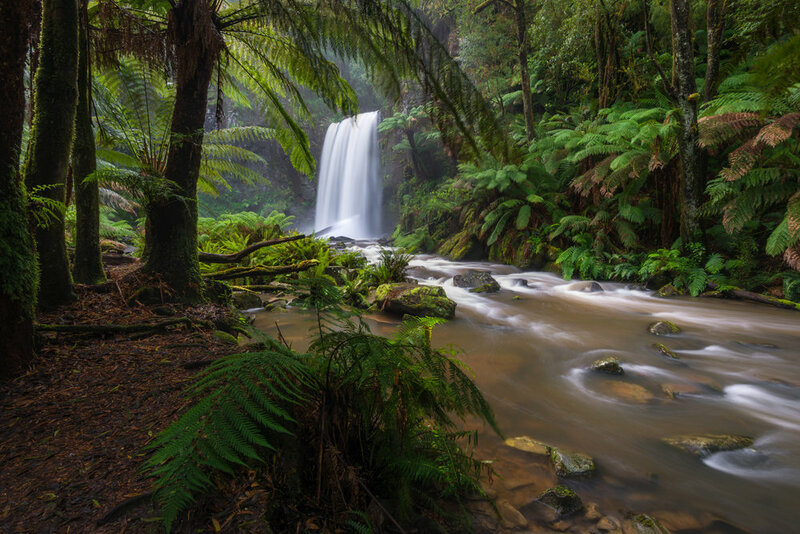 For info on what gear I used and how to best shoot the Otway waterfalls, check out this previous blog post. Ladies Bath Falls is the first point of interest you will come across on the road leading up to Mount Buffalo in Victoria's High Country. Mount Buffalo has over 90km of walking tracks featuring panoramic scenery, waterfalls and amazing granite outcrops. The history behind this location states that ladies on their way to the chalet on top of Mount Buffalo during the 1930's and 40's would take a break during the long train journey from Melbourne to refresh themselves at the falls before the final leg up the hill. On this particular day it was a couple of very brave teenagers that were attempting to take a dip in the alpine water. Summer was nowhere in sight, so needless to say there were a lot of chilled screams as they jumped in. When you love waterfalls as much as I do, adding the Blue Mountains to this list is a ‘no brainer’. The Blue Mountains are approximately 2 hours drive inland from Sydney and are home to some of Australia’s most iconic landscapes and waterfalls. My favourite spot up there is Empress Falls along the Wentworth Falls circuit in the Valley of the Waters. I spent hours there just exploring different angles and compositions. It was an overcast day so the light down in the valley was perfect. There was a steady flow of people coming through but there are plenty of places to shoot from without having to worry about anyone getting in your shot. There are over 900 stairs down to this location however it is definitely worth the effort. Plus there is a coffee shop/restaurant back up at the carpark so you can recharge with some food and a caffeine hit when you get back. Also, just before I captured this image I had the opportunity to watch a large canyoning group abseiling down from the top of the falls. If I had more time in the area I would have loved to give it a go. It looked like an awesome adventure! 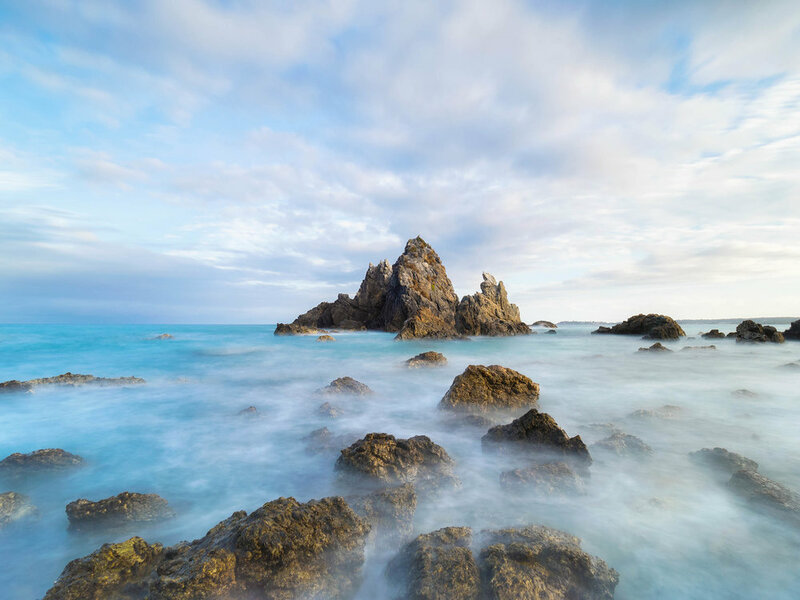 A short drive from the quiet little coastal town of Bermagui in New South Wales and you come to 3 craggy peaks rising up out of the ocean, commonly known as Camel Rock. The formation was named by Bass and Flinders during the first mapping of the coastline of New South Wales. Taking unique images in this location is largely dependant upon the tide as particular viewpoints can only be accessed at certain times of the day. If you plan on visiting this location to shoot, be sure to check the tide times first. Sunrise is probably the best time of day to get some great light here but I have also taken some nice shots at sunset as well. In total, over the 5 months that we were on the road we covered approximately 15,000kms. Initially this may sound like a lot, but compared to the rest of Australia it's barely scratching the surface. In a country that has so many diverse landscapes, it's easy to see why so many people are on the road touring Australia. I can't wait to set off and join them on our next adventure to explore the rest of what this great country has to offer! Since the first time I picked up a camera I have wanted to photograph the waterfalls in Victoria's Great Otway National Park. Images of these majestic falls have filled my social media feeds for years and once we started planning this 6 month road trip, I knew that this was a place that I had to add to our itinerary. In this blog I will describe each of the falls and the walks down to them. At the end I have listed some suggested gear and settings for your photographs. The three main waterfalls are located north-east from the Lavers Hill junction on the Great Ocean Road. From the junction along the Colac-Lavers Hill Road, it is only a 15 minute drive to the first of three which is Triplet Falls. The walk into Triplet Falls meanders amongst lush rainforest and features many a tiny subject for macro photographers to focus on. The track is quite an easy grade with steps in a number of locations. There are 3 viewing platforms once you reach the falls. Each will take you a little higher providing different vantage points through the rainforest. When you begin the walk you have the option to go left or right. The path to the right is a more direct route to the falls however my preference was to go left which takes you to the lowest point first and then moves up the falls to the top. In total, it will probably take approximately 35-45 mins return including time at each of the lookout platforms. Unfortunately there is a lot of thick forest between you and the falls, and on some of the platforms it can really obscure your shot. The best view of the falls in my opinion is from the highest platform. The next location is Hopetoun Falls. Hopetoun Falls is definitely my favourite of the three and provides the most variety when it comes to compositions. The falls are located approximately 10 kms further east once you return to the main road from Triplet Falls. In this section the walk is not a long one (10-15mins to the bottom) but there are a significant number of steep steps which can be quite slippery after rain. A moderate level of fitness is required. Once you reach the end of the trail, you will find yourself at a large platform which provides an excellent view of the falls and access to setup for probably one of the more well known compositions. Depending on how agile you are, there is opportunity to climb down to ground level and follow one of the various well trodden tracks to get up closer to the base of the falls. You may even be able to shoot from a rock in the creek if the water level isn't too high. Because of the steps, the return walk may take up to 20-25 mins. I've saved to longest walk til last! Well....it's not all that much further than the others but if your walking back up to the car park in pouring rain like I was...it can feel like an eternity 😀. Beauchamp Falls is relatively close in proximity to Hopetoun and while there aren't as many steps to the bottom, the gradual incline all the way down can be slippery and wearing on your knees if you aren't taking it slow. Once you reach the bottom there is a small number of steps that will lead you up to a platform that overlooks the falls from the side. Your line of sight to the falls is unobstructed and will provide an easy vertical composition. It can be tricky though to setup a tripod on the viewing platform because of the mesh floor. Your tripod legs will most likely fall through the holes so take care when setting up for your shot. The floor can also be quite bouncy so it is also best to try and capture your shot with no one else on the platform. Either that or ask them to stand very still (this can also be an issue on the platform at Hopetoun Falls). There are a number of photography tools that you can utilise to achieve some great results in these locations, however your primary 'must have' pieces of equipment (aside from your camera) will be a polarising filter and a tripod. The use of a tripod will keep your camera steady and help you to achieve longer exposures and sharper images. A polariser is instrumental in cutting through glare/reflections on water and can significantly increase colour and contrast in your image. Overcast conditions are also ideal for shooting waterfalls as it reduces the dynamic range in the light and makes capturing the scene a whole lot easier. Obviously you can't always rely on having the perfect overcast conditions, so to combat the large dynamic range created on sunny days you will need some additional tools. These can include a neutral density filter (ND filter) to allow for longer exposures to smooth out water in bright light, and a graduated neutral density filter (GND filter) to darken brighter areas at the top of your frame. I use Nisi Filters for the majority of my images. Their V5 filter system has a built in circular polariser and is great value for money compared to other brands. For waterfall images I would suggest using either a 3 stop or 6 stop ND filter depending on the amount of light and how smooth you want the water to be. For additional information on how to utilise a polarising filter or graduated and non graduated neutral density filters, head over to the Digital Photography School blog as they have some great tutorials. In the images that I captured of these falls I only used a circular polariser (CPL). The conditions on this day were perfect as it was completely overcast with no additional sunlight. It was also raining which would have made using any kind of larger ND filters an onerous task as I would have been constantly having to clean them. As it was, the spray from the falls and the continual rain required me to wipe my CPL in between shots but the surface area is a lot smaller and easier to keep clean than the larger square filters. My settings for these images were pretty similar for each shot. I predominantly used ISO 100 to ensure the least amount of noise, and apertures ranging from f/8 to f/16. For any compositions where I used a wide focal length with foreground interest I would use f/16 to keep as much in focus as possible from front to back of the image. Shots where I had zoomed in, I used f/8 or f/11 as longer focal lengths cause compression and layering which bring components in the image closer together, requiring less depth of field. The focal lengths and lens that you choose to use are completely up to you. For this shoot I chose to predominately shoot wide with a 16-35mm lens. My shutter speeds would vary between 1/8th second to 3 seconds depending on how smooth I wanted the water. It was also quite windy on the day so I would sometimes use shorter shutter speeds to limit the amount of blur in the trees as they were moving around quite a lot. I realise that some of you may have questions in regards to the topics I have covered in this blog post and if you are keen to find out more, I am happy to talk anytime. Feel free to comment below, contact me via email or direct message me via one of my social profiles (Facebook, Instagram etc). Thanks for stopping by and I hope some of what I have written here will be useful to you. Wow it feels like such a long time since I last sat down to write a post about my travels. I planned on making the Eyre Peninsula the next topic but first we had to finish that leg of the trip and then I needed to collate the images. As I write this we have been taking a week off from travelling to relax for a bit in the Adelaide area. We ditched the confines of our caravan for a little luxury and rented an apartment on the marina in North Haven. This week photography has taken a back seat and I’ve played tourist as much as possible. From Adelaide Zoo and Haigh’s Chocolate Factory to the Barossa Valley and the Adelaide Hills…my stomach has grown and my wallet has shrunk :) I digress however… onward to the topic for this month’s post! This post will be a brief overview of our journey around the peninsula and will mainly serve as a photographic journal however I will post relevant info for all locations we visited. The scenery along the coastal drive is simply spectacular and extremely varied between the east and west coasts. There are a number of ways to explore this beautiful piece of South Australia however we decided to skirt around the outside, leaving from Port Augusta and heading across the top of the peninsula to Ceduna. The drive across is about 470km and you could drive it all in one go however you would miss some interesting places along the way. The highlight for me in this area was Pildappa Rock which is about 15km north-east of Minnipa. The rock itself is a large, isolated granite inselberg. Some locals say that the spectacular wave-like formation rivals Wave Rock in Western Australia. Ceduna was our next stop and we opted for the semi-remote Wittelbee Conservation Reserve to park our van for a few days. Despite having no facilities, the completely serene environment makes up for it. We had a perfect campsite overlooking the surf and limestone cliffs and we honestly didn’t see another person the whole time we were there. Our only visitors were a large number of cormorants that frequented the sun soaked rocks and a friendly seal that we spotted numerous times. We even caught him napping in the water! Another 100kms down the coast and we came to my son’s favourite spot, Streaky Bay. There are a great many points of interest in this area all within a days driving distance. My pick of them all was popular surf beach ‘The Granites’. It is a great place to spend the day with sheltered swimming areas for the kids and the beach itself is covered in granite outcrops that stretch as far as the eye can see. It is also the perfect place to photograph at sunset. Cape Bauer: Take the loop road for an awesome drive along a scenic section of coast with numerous areas for photo opportunities. Another location that is within easy driving distance from Streaky Bay is Murphy's Haystacks. These Stonehenge-like, natural rock formations are also inselbergs just like Pildappa Rock. These uniquely shaped granite boulders are located 40kms south-east of Streaky Bay. There are a number of small groups of these in the area right in the middle of a farmers field! Their name originated when a traveller in a coach saw the formation from a distance. He thought the mounds to be bales of hay and he asked how a farmer could produce so much. As the farm was on a property owned by a man called Murphy, the rocks became known as Murphy's Haystacks. There are a number of small fishing villages along the west coast that also warrant a visit. We unfortunately didn't have to time to stay but we did manage a walk down to the awesome Talia Caves and a sunset at Venus Bay. One of the most epic lookouts we came across during this part of the trip was Leo Cummings Lookout. This location is right on the Flinders Highway as you drive approximately 20kms south of Sheringa. The cliffs are a sheer drop down to the raging surf below. We had to endure a passing storm and a spot of hail while we were there but waiting around paid off as I was able to get some really nice shots. 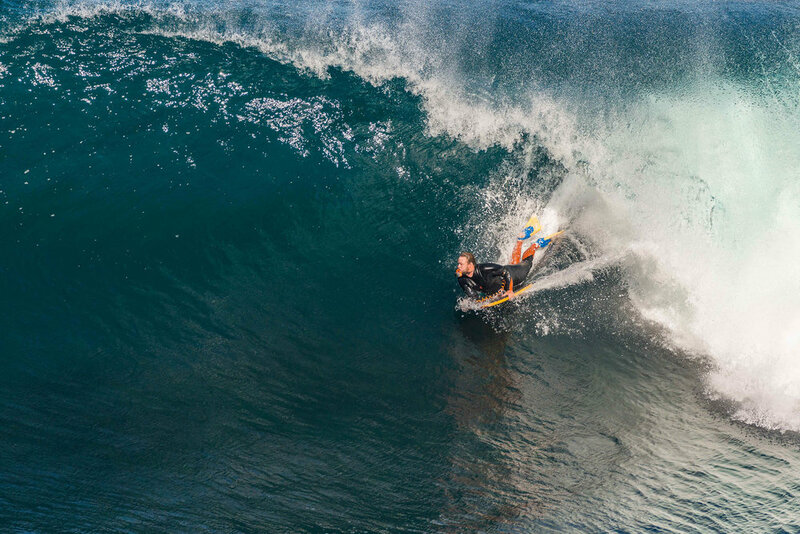 While there I also met a couple of mad-keen bodyboarders who were making their way down the cliffs to catch some of the massive waves. Being the daring adventurer that I am, I opted to remain on the cliff top and grab some shots of them with my Sigma 600mm lens. Awesome layering in the cliff face along with a lone sea stack at Leo Cummings Lookout. Now while we also visited Port Lincoln, I had a couple of days off from taking photos so I don't have much to show for our time there. It was however a beautiful area with some of the best seafood I have ever tasted c/o The Fresh Fish Place. It is also worth visiting the Lincoln National Park and Whalers Way. Next port of call was a fantastic little spot called Lipson Cove. Lipson Cove is on the eastern side of Eyre Peninsula halfway between Tumby Bayand Port Neil. The beach is pure white silica sand surrounded by the clearest, blue water I have ever seen! It even made the list of 101 Best Beaches in Australia. It is easy to see why! The final stop on our road trip was the lighthouse at Point Lowly, 30 mins north-east of Whyalla on the east coast. The Point Lowly lighthouse was built in 1883 to guide ships on their way to Port Augusta and Port Pirie in South Australia. It was deactivated in 1993, however in 1995 it was turned back on as a tourist attraction. So as you may have noticed, there are many locations that don't feature in my post as we unfortunately didn't get a chance to explore them all (gotta save something for next time). To experience all the wonders that the Eyre Peninsula has to offer I would recommend taking at least 3 weeks as it is a surprisingly big place. We only allowed 2 weeks and that is just covering select locations along the coast.